Portable Note Taker: Scan, Store & Transfer to PC up to 500 pages! 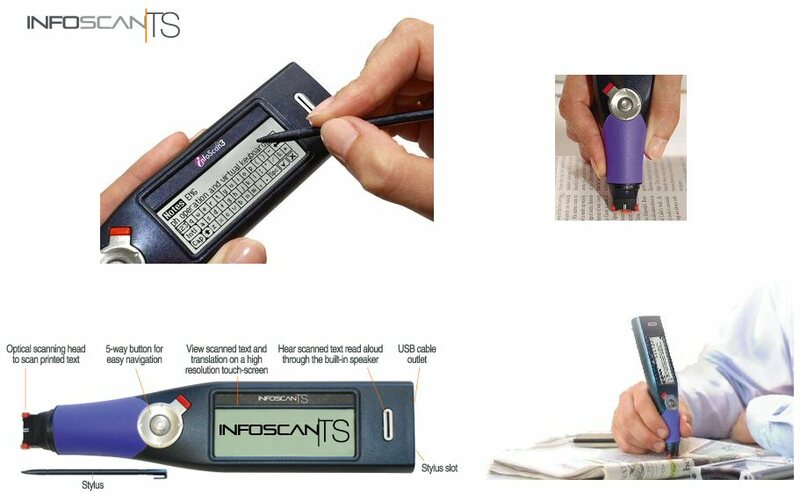 The InfoScan TS text scanner from Wizcom Captures text that can be transferred to your PC and saved as editable documents. The Info Scan pen is the ideal gift for academics, business professionals and students burning the midnight oil. InfoScan, WizCom's Electronic Note Taker, is used just like a yellow highlighter. InfoScan enables users to scan and transfer printed text directly into a PC or scan, store and transfer up to 500 pages of printed data to a PC, laptop, PDA or any Windows application via an Infra-red or a USB connection. This completely mobile device offers users a quick and easy way to take notes from almost any printed document, creating fully editable MS Word documents on the PC, PDA or any Windows application. The InfoScan™TS is an ideal tool for students, researchers and business people who need to scan data even when they are away from their computers. The fully portable InfoScan™TS is equipped to store large amounts of scanned text which can be transferred to the computer when convenient. It can also be used to scan text directly into any Windows-based application. 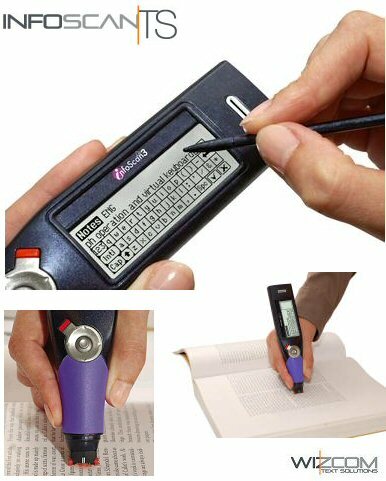 Portable hand-held scanning device for scanning, storing and transferring printed text to a PC or Smartphone. This completely mobile Pen can scan up to 20,000 lines (500 pages) of text at a time, offering a quick and easy way to take notes, creating text that is fully editable in Windows applications. No more taking notes by hand or photocopying. With the InfoScanTS you can scan and store up to 20,000 lines of text at a time. Transfer data easily using Infra-red (IrDA) or USB connectivity. Navigate easily with the icon-based menus and use the virtual keyboard to manually insert words or to edit scanned text. Take the InfoScan TS anywhere you go. This small, portable, handheld device is designed to fit in your pocket. The InfoScan TS is an ideal tool for students, researchers and business people who need to scan data even when they are away from their computers. The fully portable InfoScan TS is equipped to store large amounts of scanned text which can be transferred to the computer when convenient. It can also be used to scan text directly into any Windows-based application. Stores text with individual file names. Supported scanning languages: English, French, German, Portuguese, Spanish. Recognition of a wide range of printed font types and sizes (6-22 points - up to 8mm), including inverted text on contrasting backgrounds. Recognition and automatic merge of hyphenated text. Size: ergonomic 6 inches x 1 x 1, lightweight 85g.